Whenever a certain natural substance gains a lot of popularity in today’s mainstream media, it becomes easy to forget the reasons why the substance is so beneficial. With its popularity, the oil, food, herb, or other substance becomes nothing more than a staple or specialty item. While it’s important that we give these natural substances the attention they deserve, we also need to remember why they deserve that attention in the first place. So many natural substances and their significant health benefits are being forgotten today. You may be familiar with sesame seeds due to their popularity in Asian dishes. It may sometimes also be referred to as gingelly oil, but regardless of the name, the oil is derived from sesame seeds to produce a vegetable oil. Sesame seeds, scientifically or botanically named Sesamum indicum of the Pedaliaceae family, are small seeds of a yellow or brown color that primarily grow in Africa. With that said, they can also be found in some areas in the Indian subcontinent. While sesame seeds and sesame oil have certainly been primarily used in Asian cuisine throughout history, the oil is also present as a base in a large majority (around 90%) of Ayurvedic medicinal oils. In fact, sesame has such a prominent place in history that it is actually considered to be the world’s oldest plant that has been used to create an oil. Ancient Egyptians have been using it since 1500 B.C. for the treatment of pain, and China has been using it in food, medicine, and inks for over 3,000 years. While primarily used for medicinal purposes, there was also a time when both Greek and Roman soldiers would consume the seeds with honey in the form of what we might call an energy bar today. There are two types of sesame oil that you might find on the market today. One is light, or untoasted, sesame oil, and the other is dark, or toasted sesame oil. Light sesame oil is pressed from raw seeds and has a lighter color and flavor. On the other hand, dark sesame oil is pressed from seeds that have been toasted and has a darker color and stronger flavor. Of the two, dark sesame oil is more commonly used in Asian cuisine, while light sesame oil can be found more frequently in medicinal practices of the Middle East. Sesame seed oil is rich in many essential nutrients that are thought to be able to help treat several different health conditions. With that said, many of those benefits are still being studied, so a doctor should always be spoken to first before attempting to treat any serious conditions with any kind of natural substance on your own. Some of the many nutrients contained in sesame oil include vitamin B, vitamin D, vitamin E, calcium, phosphorus, and proteins. It is also a great source of healthy polyunsaturated and monounsaturated fats. 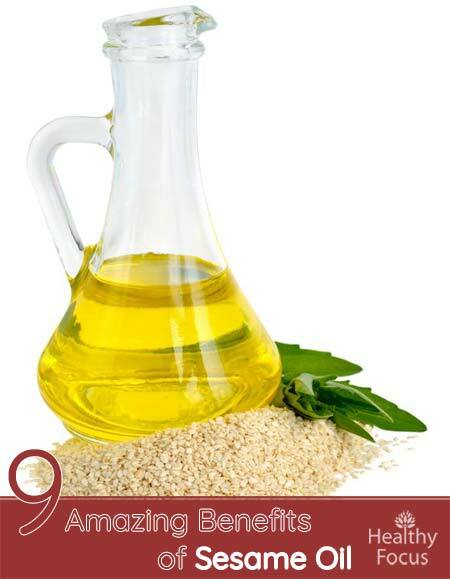 Similar to many other natural oils, sesame oil is a great addition to both your skin and hair care routines. Applying sesame seed oil to your hair, either directly to damp hair or by mixing it in with your favorite shampoo or conditioner, can help reduce hair loss and retain your hair’s natural color. The antibacterial properties of the oil can also help protect your hair and scalp from pathogens or other foreign attacks. For the skin, the mineral zinc helps reduce premature signs of aging and reduce the appearance of blemishes; the oil can also be used as a method of sun protection and a treatment for fungal skin diseases. The healthy fats found in sesame oil, including the polyunsaturated fatty acids sesamol and sesamin, are also essential in promoting a healthy heart by balancing cholesterol levels and preventing conditions such as atherosclerosis, heart attacks, and strokes. Similarly, the high amounts of copper and zinc can also help stimulate blood flow and a healthy metabolism. Copper also has natural anti-inflammatory properties that can help treat conditions like gout or arthritis by reducing swelling and strengthening your bones. On that note, general bone health can also be helped by the use of sesame seed oil. Calcium, copper, and zinc are all minerals found in sesame oil that are essential to developing healthy bones. Therefore, the oil can help aid in the speedy recovery of bone regrowth and the prevention of conditions like osteoporosis, along with other weaknesses of the bones that come with age. Sesame oil has also often been used for the promotion of better oral health in its ability to whiten the teeth, reduce dental plaque, and protect the mouth from certain illnesses. Sesame oil has antibacterial and anti-inflammatory properties meaning it is a great natural remedy for relieving tooth infections or gingivitis and soothing swollen gums or cheeks. Like some other natural oils, sesame seed oil has also been shown to have positive effects on the treatment and prevention of some cancers. The oil contains an organic compound by the name of phytate, which has been proven in countless studies to reduce the development and growth of cancerous cells. High concentrations of magnesium found in sesame oil may also reduce the risk of colorectal cancer, just as high concentrations of calcium can help reduce the risk of colon cancer. As many people around the world suffer from symptoms of anxiety and depression, having a natural substance that could help relieve these symptoms could make a big difference for a lot of people. Tyrosine, a nutrient found in sesame oil, has been studied to show a connection with serotonin in the brain. Serotonin activity helps boost a person’s mood and increase happiness with relevant enzymes and hormones. Therefore, consuming sesame seed oil may help people who suffer from anxiety or depression to experience a positive boost in their mood. With that said, natural oils like this have not been studied enough to be used as a replacement for any medications you may have been prescribed by a doctor, therapist, or psychiatrist. In these cases, you should speak with your doctor before using sesame oil for this purpose, as they may be able to work with you to safely see if the substance has any positive effects outside of your prescribed medication. A comedogenic rating is a score that is given to different natural substances that are expected to be applied topically to the skin. These ratings help people determine which oils will be most suitable for their skin type, especially if they know that they are prone to sensitivity or skin irritations. A rating is given on a scale from zero to five, with the lowest scores representing substances that are the least likely to irritate your skin, clog your pores, or worsen skin conditions such as acne. With that said, the ratings are only meant to be taken as words of advice, as people with sensitive skin may not react poorly to high-rated substances, and people without sensitive skin may still have a reaction to low-rated substances. Sesame oil has been given a comedogenic rating of three, which lands right in the middle of the scale. This means it is just as likely to cause a bad reaction in somebody as it is to be safe, so you should be careful with this oil if you know that you are prone to sensitivity or skin irritations. With that said, sesame oil is still often used as a base or carrier oil in many skincare and cosmetic products, so be aware of the products you are using on your skin, especially if you are prone to sensitivity. sesame oil is generally believed to be safe both for consumption and cosmetic purposes. The oil has been well-evaluated for its use as a cosmetic ingredient and deemed to be safe for topical use. To stay on the safe side, you should perform a patch test by applying a small amount of the oil to a discrete area of skin to make sure you are not sensitive to it. As regards the consumption of sesame oil, it is believed to be safe in appropriate doses for the vast majority if healthy people. However certain people should avoid eating sesame oil. People who are allergic to sesame seeds should not consume sesame oil. Pregnant women and nursing mothers should also be careful since it can have an effect on the hormones. This may trigger early uterine contractions leading to early labor or even miscarriage. It is best for pregnant women to stay on the side of caution and avoid consuming sesame oil. What are the benefits of sesame oil on the skin? The linoleic acid found in sesame oil has anti-inflammatory and antibacterial properties making it suitable for topical use. It is easily absorbed by the skin and rich in antioxidants and minerals that can nourish and protect your skin. The antioxidants found in sesame oil can protect your skin from the harmful effects of free radicals and may help you get rid of unwanted wrinkles and other signs of aging. Is sesame oil bad for you? Sesame oil is an oil so it is high in calories and fat. However, some oils are much better for you than others and sesame oil is definitely one of the healthier options. It is a good source of minerals as well as being a rich source of healthy monounsaturated and polyunsaturated fats. Can sesame oil be used for hair? Sesame oil can certainly be used on your hair. It has excellent lubricating and nourishing effects and can keep your hair looking and feeling strong and healthy. Sesame oil is also good for your scalp and may help treat scalp issues like dandruff and inflammation. If you’d like to get the most health benefits out of your sesame oil for topical or medicinal uses, it is best to purchase oil made from unrefined, untoasted sesame seeds. Because of the popularity of this oil, it should be easy to find at any grocery store next to other cooking oils. With that said, organic sesame oil may be separated with the other organic products, and toasted sesame oil would likely be put in with the Asian or ethnic food aisle. Toasted sesame oil is typically sold in small containers, as a little goes a long way with that type of the oil. As sesame seed oil is rich in antioxidants, it is able to be stored for a long time before it turns rancid. With that said, it should still be stored in a cool and dark place to extend its shelf life. Always check your oils before using them, and throw them away if they have changed in color or have developed a foul odor. The more warmth or light that the oil is exposed to, the quicker it may turn rancid on you. Before using sesame oil, or any other oil, to treat any serious health conditions on your own, you should always speak with your doctor first. If you are already taking prescribed medications for your condition, the use of some natural substances may interfere with that medication, which could potentially only make things worse instead of helping. If your doctor approves the use of sesame oil, you might also want to consider seeking advice from a holistic health practitioner to help you determine the proper dosage and application methods necessary to experience the majority of the oil’s benefits. Sesame oil is a healthy choice of oil that you can use for cooking. It is rich in nutrients and high in healthy unsaturated fats. Sesame oil has a wide range of potential health benefits ranging from cancer and heart health to oral health and easing anxiety. It can also be applied topically to the skin or used as part of your hair care routine. It is generally considerd to be a safe and healthy oil both for consumption and topical use.